Tattoos have become a very popular way of permanently modifying our appearance however as time passes we can come to regret the decision. What seemed like a good idea at the time can cause problems in later life. 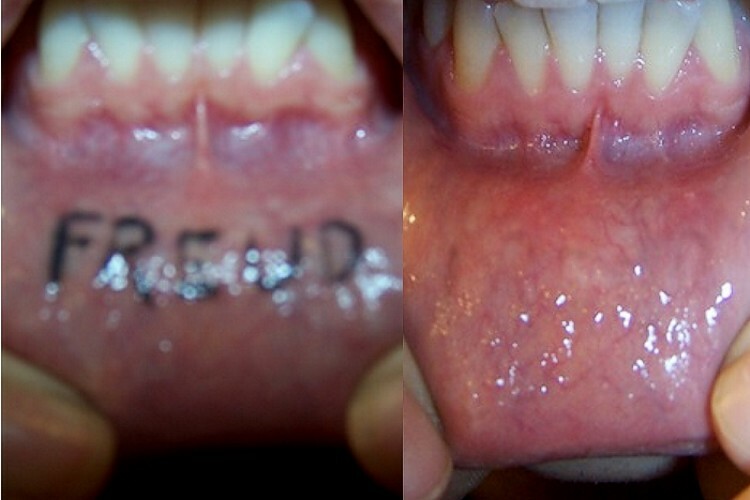 An unwanted tattoo can cause psychological distress, and create difficulty in social and work environments. The good news is that laser removal techniques can eliminate your tattoos with minimal side effects so you won’t have to live with it for the rest of your life. 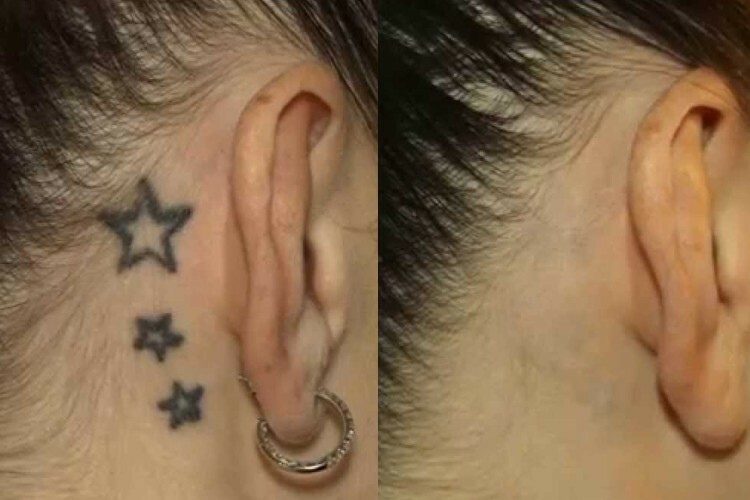 Lasers remove tattoos by breaking up the pigment colours of the tattoo with a high-intensity light beam. The body then absorbs and eliminates the shattered molecules. Laser tattoo removal is a clinically-proven method of removing a tattoo without causing scarring. The Nd:YAG Q-switch laser, has been designed to create ultra-short pulses of light energy that shatter ink in a tattoo. Tattoo ink (particularly the older inks) can be difficult to shatter and remove, and Nd:YAG Q-switch lasers are able to produce sufficient fluency (energy or power) to remove dark and bright tattoos without unattractive side effects like scarring. Q-switched laser pulses last mere nanoseconds (billionths of a second), providing high levels of fluency for quality ink shattering. During a tattoo removal procedure, laser light is applied to the tattooed area of the skin. The light is selectively absorbed by the tattoo ink particles, leaving the surrounding skin tissue and unharmed. The tattoo ink particles absorb the laser energy, heat up, and shatter into smaller ink particles. In the days and weeks following a laser treatment, the body’s immune system flushes away the shattered ink particles, causing the tattoo to fade. Over a series of treatments, more and more of the ink shatters, leaving the skin free of ink. 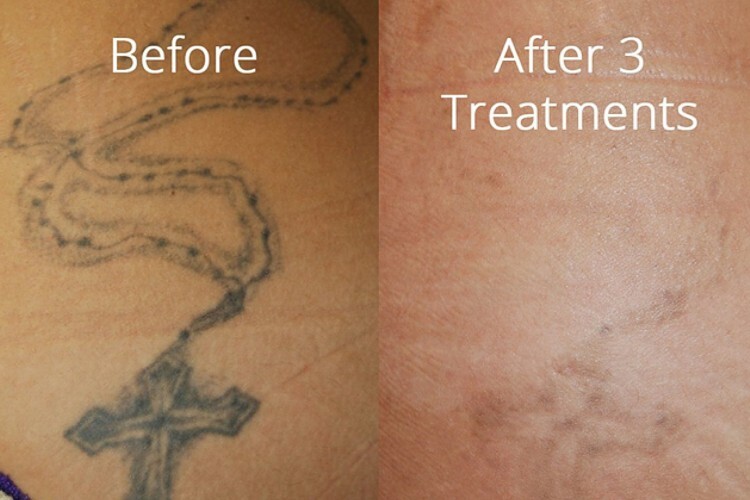 The Q Switch laser is safe to treat on all skin types, so everybody can benefit from Laser Tattoo Removal. This technology can be used on light and dark skin types. A brief consultation with one of our highly-trained Nd:YAG Q Switch specialists should provide all the information needed. Depending on the tattoo, 4 to 12 sessions are required. Sessions are usually spaced 6 weeks apart. The number of sessions are usually discussed and explained to you on your first consultation. Prior to session avoid sun exposure for 2-3 weeks and after the session also 2-3 weeks should be avoided on the treated area. During the session you will feel a warm prickling feeling, and after the session it will feel like slight sunburn on the treated area, scabbing can appear in the next 48 hours but will clear up in 3-5 days. After the session a cooling Aloe gel will be applied, and should be used for 2 days after the treatment to keep skin moist. In the next weeks following your next appointment your tattoo will start to fade. Copyright 2018 - Laser-Erase. All Rights Reserved.